The design for the new 105,000 SF Student Wellness and Recreation Center located on the west campus transforms a large asphalt parking lot into a new vibrant campus hub. Nestled tightly against the existing athletic fields and residential quad, the new building creates an iconic front door to the west campus thus establishing a renewed sense of community. The project team and University representatives engaged in an open and transparent process beginning with intercept interviews and student workshops leading to a broader campus wide engagement to redefine the health and wellness for the entire campus community. 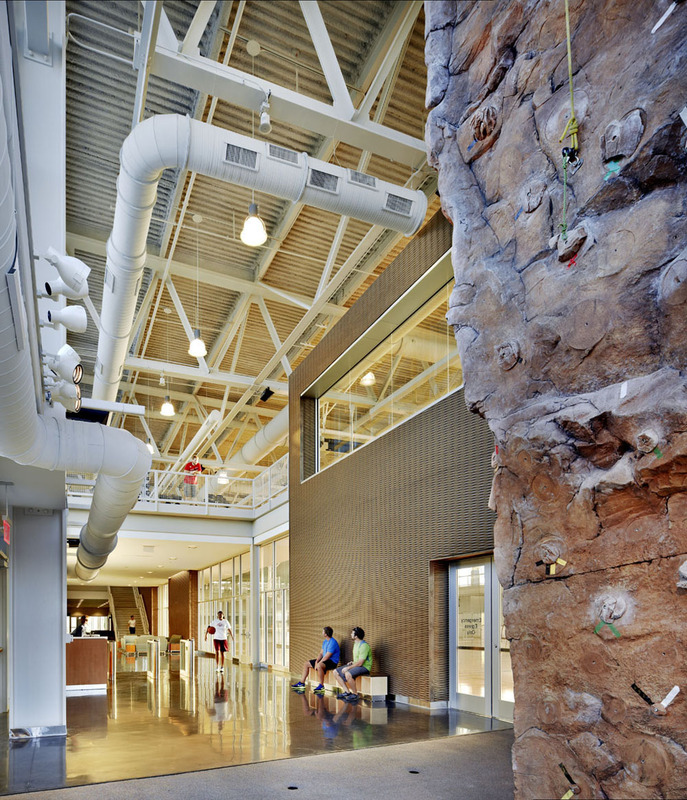 The building program combines student recreation, health and counseling services, and intercollegiate athletics in a highly visible “gateway” building at the campus’s west edge. 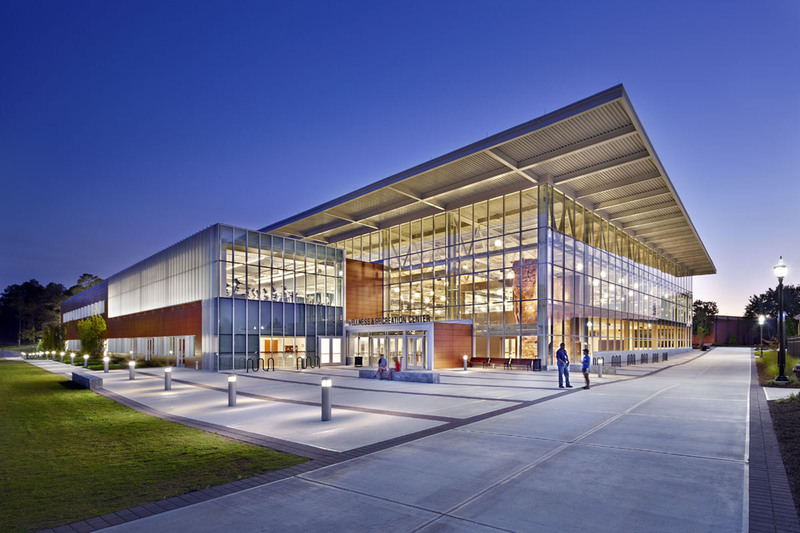 Designed as a two-story long span volume along the north-south axis, the 360’x140’ building interconnects a four-court gymnasium with an elevated jogging track, competitive swimming and leisure pools with spectator seating, fitness and weight training areas, a large multipurpose room, administrative offices, and clinical space for student health services and counseling. 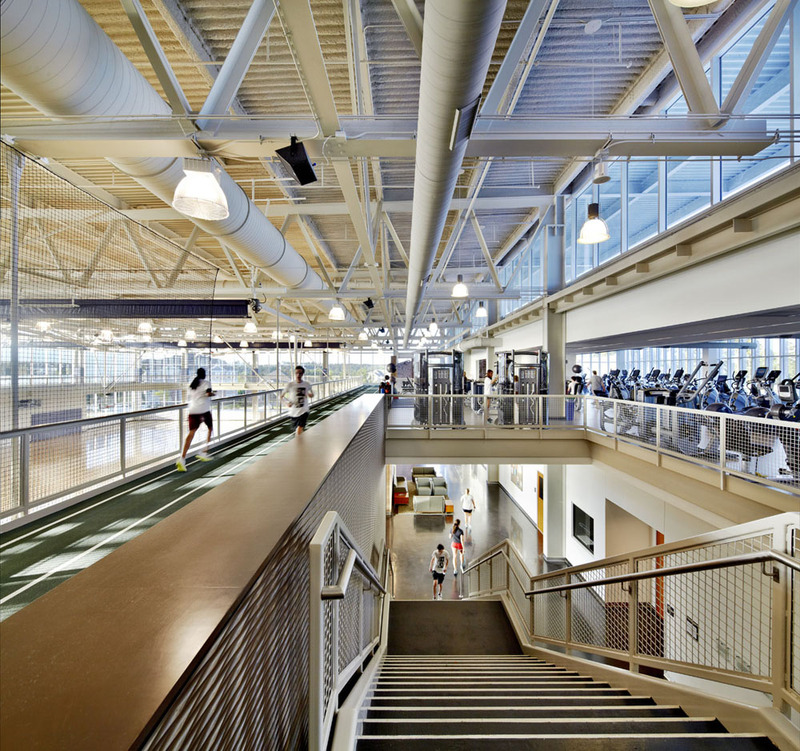 Immediately recognized as the new community hub of the campus, the new Recreation and Wellness Center thrives as a place for students, faculty, staff, and the entire campus community. The design concept metaphorically envisioned a floating two-and-a-half story-high parallelogram roof plane as a community “umbrella” under which all the program elements, both open and enclosed, would be organized. The dynamic roof plane is terminated with a large twenty-five foot cantilevered overhang at the northeast and southwest corners to provide shade to the two-story high glass facades on the building’s north and south elevations. At night, the glass volume creates an iconic beacon for the campus. 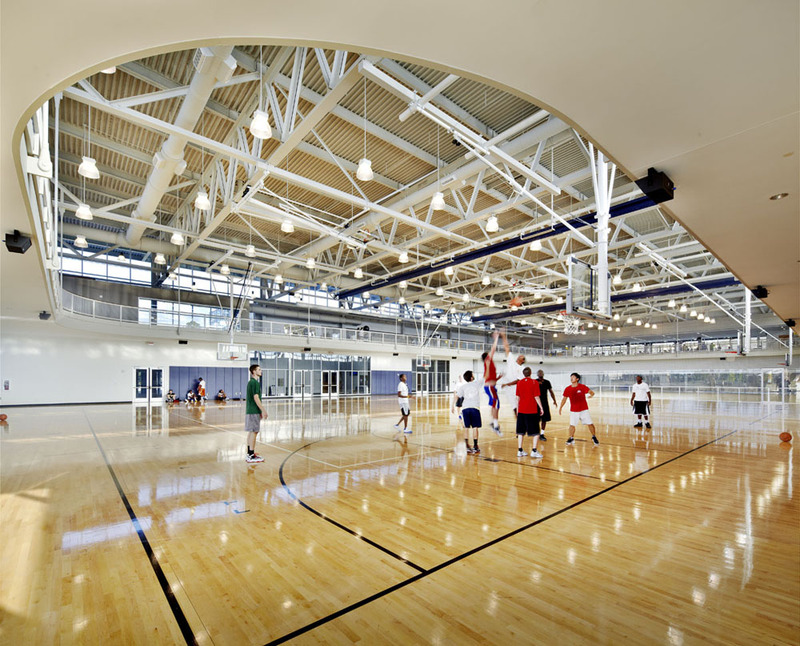 A secondary circulation corridor connecting locker rooms, the fitness center and a cantilevered multipurpose room runs (transverse) east-west creating a natural barrier between the natatorium and the gymnasium volumes. Large expanses of curtain wall on the east and south façades foster beautifully daylit, contemporary spaces while providing views of both interior activity and adjacent green spaces. 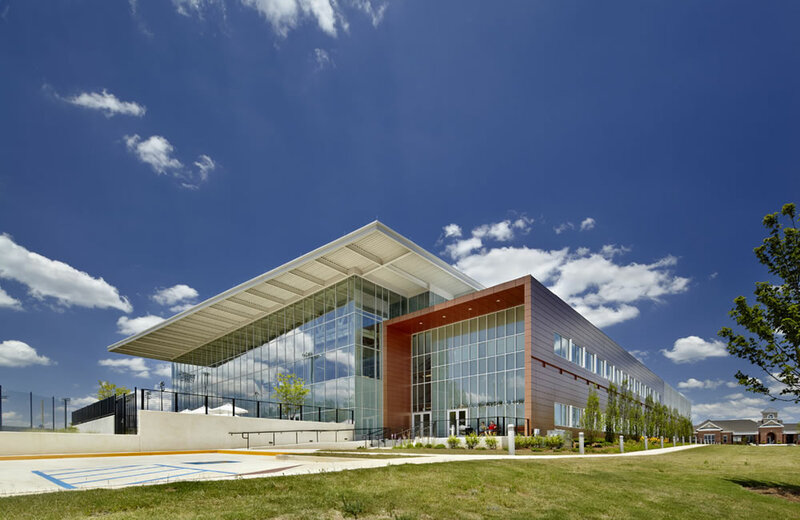 A matte copper colored insulated metal panel system integrates the contemporary design of the new facility seamlessly with the existing brick campus. High performance PPG XL 70 insulated glass, both clear and heavily fritted as required, is employed to control glare and diffuse daylight. Polished concrete floors, acoustical CMU block walls, and interior fiber cement wall panels contribute to a durable interior environment necessary for a low maintenance and sustainable building life. The project team employed many sustainable building design strategies including energy-efficient mechanical systems, day-lighting, high-performance glazing and heavily fritted glass, exterior sun-control devices, bio-retention storm water management, recyclable materials and a “super insulated” roof and envelope. 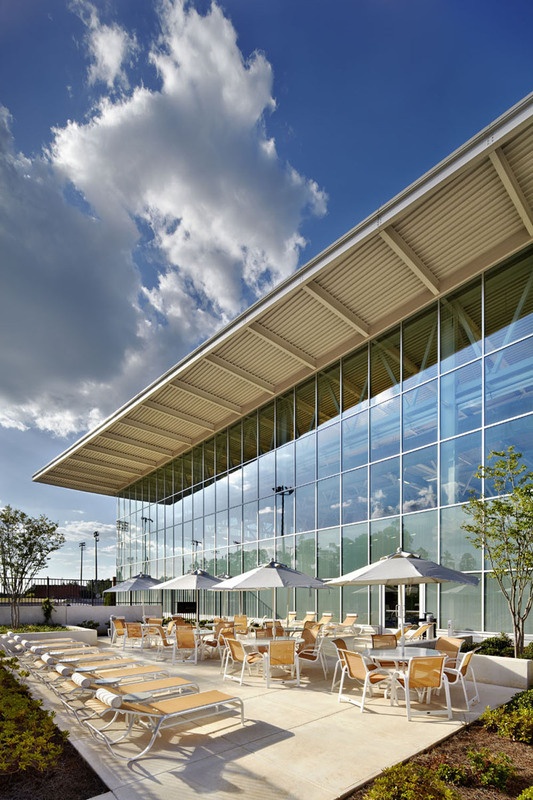 In addition an all-white high albedo roof membrane is used to reflect heat gain at the roof. The building achieved LEED Silver certification. 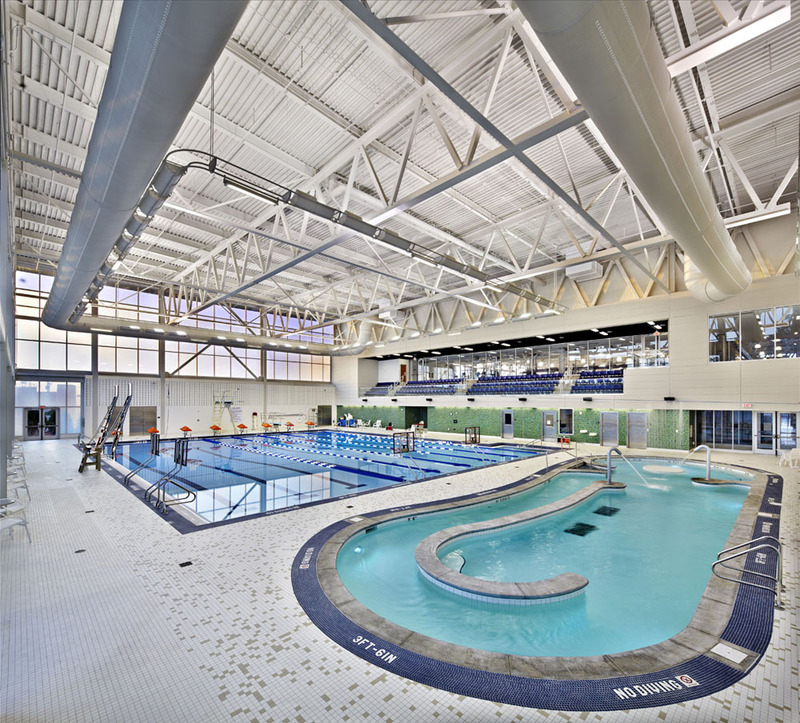 In 2009, Tony along with Jessica Grosse began programming and design of our Wellness & Recreation Center, a $29,000,000 project. Construction for this facility began in August 2010. The services Menefee Architecture have provided through this early phase of construction have more than met our goals and expectations. I can without reservation recommend Menefee Architecture to you for architectural services.